Now that you have installed and configured Drupal 7, most of your tasks will be done through the Drupal 7 dashboard. You will be able to login to your Drupal 7 Administrator Dashboard from any web browser. Type in your username and password that you set up for the administrator. Note: If you just finished installing Drupal, you may already be logged in and can skip this step. You have successfully logged into the Drupal 7 admin dashboard. You may want to proceed to our next class entitled Working with Content in Drupal 7.For more information on this course please visit Installing and Getting Started with Drupal 7. If you need further assistance, please feel free to ask a question on our support center. i am getting this message when i am oppening admin page. There are a few different variables to check here. Some helpful Drupal users provided a list in this forum topic. a password to log in is exactly but i can't login. Thank you for your question. 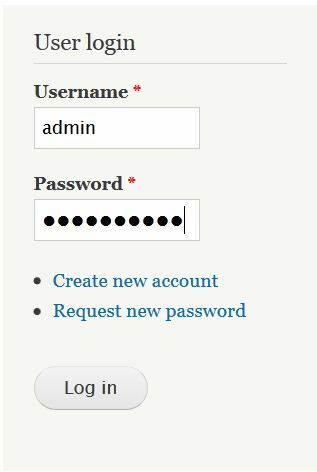 If your password/username combination is not working in Drupal 7, you may have to reset your Admin Password. I create a custom theme using drupal 7 when i logout who can i login again i try all things like www.mydomainname.com/user and www.mydomainname.com/q=user but i canot find admin login form. please help me. Other than that, the URL should work and present a login section. If not, then you may have done something in the theme to prevent it.